What Can You Do at Myrtle Beach Virtual Reality? Come alone, bring a friend, or bring a group to play, learn and explore in Virtual Reality ! Myrtle Beach VR is a Virtual Reality (VR) Arcade and Experience Center. What kind of Occasions are good for VR? No matter your experience level with technology or “video games” … if you are new to VR or technology or if you are an experienced gamer … we have something for everyone for any occasion. VR allows you to go to real or imaginary places and experience the universe in ways never before possible. Want to know more about VR or Myrtle Beach VR? Read our FAQ page. Or Book Now! Absolutely!! If you enjoy ﬁlm, music, or gaming, VR is for you. The VR experiences we offer include not only gaming but also immersive experiences that allow you to transport yourself into movies, new environments, and other planets. Because we offer both Active VR and Standing VR experiences, no matter your gaming level, Myrtle Beach VR has an experience you will love! 2 -If you are new to Myrtle Beach VR, we kindly ask that you read and complete waiver at the location. Active VR is much more immersive than the Standing or Seated VR experience. Active VR requires a VR Treadmill. 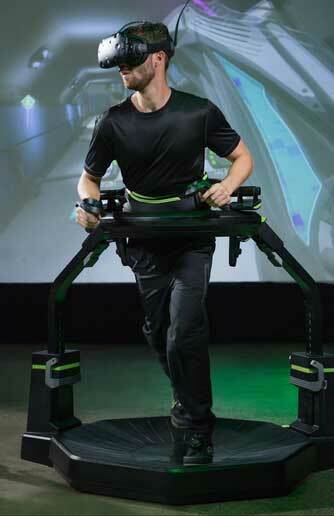 Once ﬁrmly supported in the VR Treadmill your natural walking or running motions are translated into movement in VR. Room scale VR has you standing in a space that is at least 6′ x 6′ with a headset and VR accessories (wands, weapons, etc.) 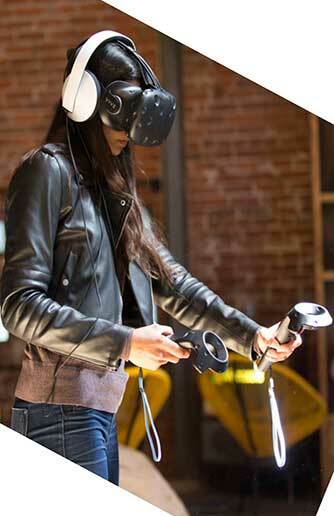 and allows you to freely move around in that space to explore your VR universe. Even though you are immersed in the virtual world, the VR system visually shows you the real-world boundaries, so you don’t run into a wall, or a physical obstacle. Myrtle Beach Virtual Reality offers a variety of VR experiences that include Active VR and Room Scale VR. Active VR experiences involve use of our VR treadmills. Room scale VR allows the participant to move around in an open area to enhance the immersiveness of the experience. Once you select Active or Room Scale upon putting on your headset you will see almost like a Netﬂix platform upon which you can select games. You will literally have hundreds of games and experiences to choose from. No worries we will help you.While there are 100’s of VR games out there, our staff evaluates and selects high quality games that are entertaining and memorable.